America’s designation of the Iranian Revolutionary Guard Corps (IRGC) as a terrorist group is an example of taking a good idea — sanctioning Iranian entities for malign behavior — one step too far. A former State Department counterterrorism official said of the designation, “The future ramifications of this decision will be profound.” He’s right about that, but “profound” may cut both ways. In 2007, the U.S. designated the Guard’s overseas operations arm, the Quds Force, for support of terrorist organizations, so the new sanctions will hit the parent organization which is already under sanctions for ballistic missile development and supporting the Bashar Assad regime in Syria. The Department of Defense (DOD) and the CIA reportedly opposed the move, and no wonder: Officials at the National Security Council and the Treasury Department are safe in Washington, D.C., State Department officers in Baghdad labor under restrictive security rules which limit their movements, which leaves the U.S. military and CIA officers exposed. Proxy war: Iraqi militias supported by Iran killed at least 608 American servicemen. Let’s-get-this-over-with: Iran quickly released the U.S. Navy crews who were captured by the IRGC Navy when they wandered into Iranian waters in early 2016. The Beirut option: In the 1980s, the CIA’s Beirut station chief William Buckley and U.S. Marine colonel William Higgins were kidnapped by Iran’s Lebanese Hezbollah allies and died under interrogation. Former FBI agent - and CIA contractor - Robert Levinson disappeared in Iran in 2007, and the FBI, then led by Robert Mueller, was reduced to asking Vladimir Putin’s most loyal oligarch, Oleg Deripaska, to fund his (unsuccessful) rescue. And the designation won’t just discomfit Americans; Iraqi officials regularly encounter Guards officers whether they want to or not. Quds Force commander Qasem Soleimani regularly visits Iraq, and the last three Iranian ambassadors to Baghdad have been Quds Force officers, so Iraqi officials can expect to be put on notice by the Americans to avoid “terrorists.” Iran is active economically in Iraq, so the designation may be bad for Iraq’s economy. One near-term effect may be to scuttle an effort to import electricity from Iran, badly needed as the country still suffers from power shortages. America’s timing is bad, as Iran’s “resistance economy” is dragging, and the government has been criticized for its lackluster response to the recent widespread, deadly flooding. These sanctions will just give the mullahs an excuse for their economic mismanagement. Given the Guard’s penetration of Iran’s economy, new sanctions might enrich it even more. If the economy becomes radioactive to outside investors because the due diligence is too hard, the IRGC could buy the remaining assets at cut-rate prices. If, in the future, the Guard is neutered and sanctions are relaxed, unwinding the sanctioned businesses will take years and will require the approval of the U.S., which will move at the speed of government. This will hobble the post-mullah regime which will be under pressure to improve the lives of newly-free Iranians. The current U.S. practice of targeting specific people and economic entities for sanctions allows the U.S. to fine-tune its actions and tells the Iranians the U.S. knows who is doing what. Given the Guards economic ubiquity, the terrorist designation is a blanket sanction with unknown consequences, though one might be increased power for the Guards. The last time a military formation of a sovereign state was declared a criminal organization was when Nazi Germany’s Waffen-SS was condemned for its involvement in war crimes and crimes against humanity. Designating the IRGC a terrorist entity may sound great after that third beer, but is IRGC commander Major General Jafari as bad as Himmler? No. 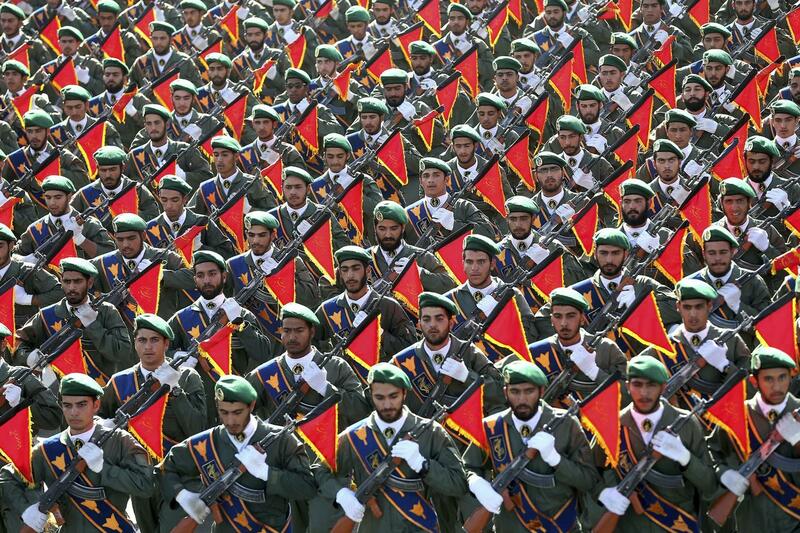 Terrorism sanctions on Iran’s Revolutionary Guards promise something for everyone, all of it bad: More American hostages, and more money for the Guards. The Americans should ignore the bright, shiny object of terrorism sanctions and remember firm, consistent pressure is the way to win the contest with Iran.